An Epidemic of Absence asks what will happen in developing countries, which, as they become more affluent, have already seen an uptick in allergic disease: Will India end up more allergic than Europe? Velasquez-Manoff also details a controversial underground movement that has coalesced around the treatment of immune-mediated disorders with parasites. Against much of his better judgment, he joins these do-it-yourselfers and reports his surprising results. 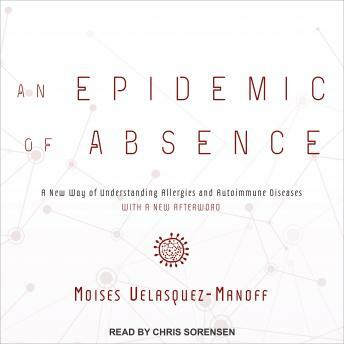 An Epidemic of Absence considers the critical immune stimuli we inadvertently lost as we modernized, and the modern ills we may be able to correct by restoring them. At stake is nothing less than our health, and that of our loved ones. Researchers, meanwhile, have the good fortune of living through a paradigm shift, one of those occasional moments in the progress of science when a radically new way of thinking emerges, shakes things up, and suggests new avenues of treatment. You'll discover that you're not you at all, but a bustling collection of organisms, an ecosystem whose preservation and integrity require the utmost attention and care.